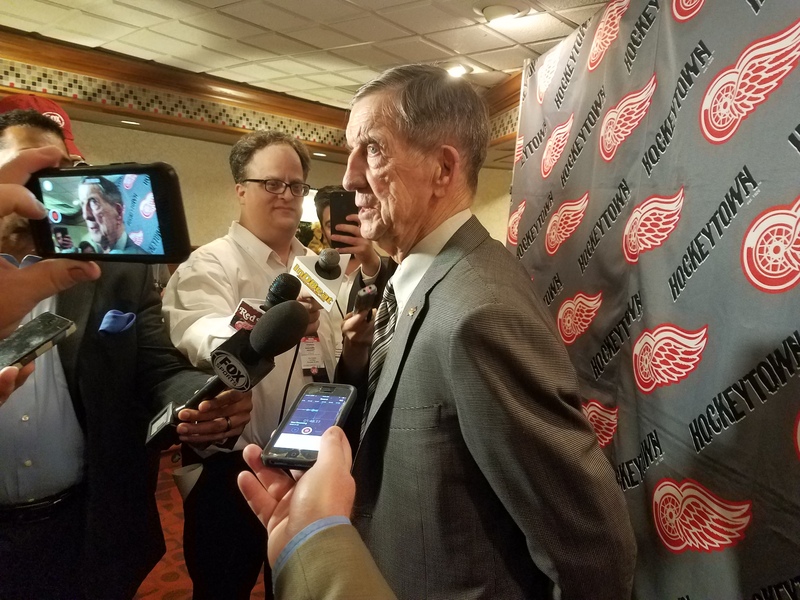 The Detroit Red Wings defeated the Dallas Stars Tuesday on Ted Lindsay Night. The team seems to be bouncing back after a four-game losing streak in which they were shut out twice. The Wings have now won three of their past four (one in a shootout, one in overtime and one in regulation) and an additional point in an overtime loss to Montreal. Lindsay dropped the puck and gave some advice to the Red Wings before the game commenced. The game began was not a good start for the home team as Dallas defenseman Esa Lindell scored 16 seconds into the first period on a fluke goal from the corner. Tyler Seguin’s shot rebounded to Lindell, who fired a low-percentage shot, which deflected upward from the stick of Detroit’s Mike Green into the top corner of Mrazek’s net. With 39.9 seconds left, the Red Wings scored on the power play (their first in the last 15 opportunities). The goal belonged to Dylan Larkin, as he deflected a Mike Green shot past netminder Kari Lehtonen. The prettiest goal of the game came at the 7:56 mark of the middle frame, during a power play. Defenseman Niklas Kronwall found rookie Anthony Mantha, who was joined by captain Henrik Zetterberg on the rush. Mantha dished it to Zetterberg, who proceeded to pass to Mantha for the goal. This caught Dallas defenseman Jamie Oleksiak completely off-guard as he was not expecting the additional feed. This would prove to be the game-winner. As the third period pressed on, there was an increase in physicality. Detroit’s young defenseman Xavier Ouellet dropped the gloves with tough guy Antoine Roussel. Ouellet held his own against the much stronger Roussel. Soon after, Mrazek and Sharp engaged in a battle in the crease. Sharp landed behind the goalie, while Mrazek enclosed him into the net, causing a stir. As he attempted to leave, the two exchanged elbows and punches. Both would receive roughing minors. With almost a minute remaining, newcomers Thomas Vanek and Steve Ott, both of whom were simultaneous captains in Buffalo (2013) led a rush toward the empty net. Vanek selflessly passed the puck to Ott, who completed the 3-1 win. Detroit moved to 11-10-2 with 24 points, three points greater than last-place Buffalo, tied with the sliding Panthers and the Maple Leafs, and one and two points behind Boston and Tampa Bay respectively. Play-by-play announcer Dave Strader was a broadcaster for Detroit after previously announcing for the Adirondack Red Wings on the radio in the early 80s. Due to his cancer diagnosis, he has not been able to broadcast recently, but he traveled to Joe Louis Arena to speak with Mickey Redmond between periods in the press box. Dallas GM Jim Nill was Detroit’s assistant general manager for 15 seasons. Former Red Wings forward Patrick Eaves ranks third in Dallas scoring this season with nine goals and 16 points in 23 games, behind only teammates Tyler Seguin and Jamie Benn. His career-high points (32) total came in 2006-07, his second season. Toronto-born defenseman Jamie Oleksiak played for the OHL’s Saginaw Spirit in 2011-12. 7 home games, 7 away games in the month of December.